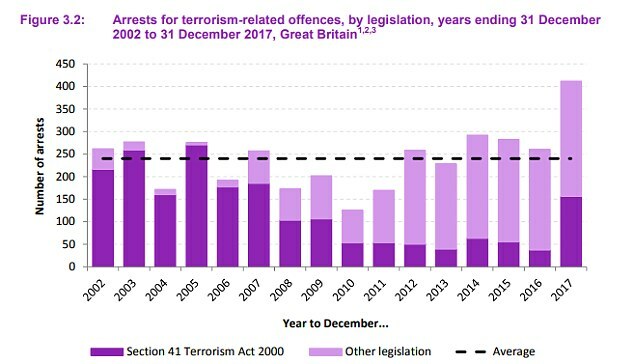 There were a record 412 arrests for suspected terrorism-related offences in Britain in 2017, Home Office figures show. That’s an increase of 58 per cent compared with 261 the previous year and the first time the tally for a calendar year has been above 300. …The figures also reveal the majority of those in custody held Islamist extremist views. Of those detained, 86 per cent held ‘Islamist Extremist’ views, with nine per cent holding ‘Far-Right’ beliefs and five per cent subscribing to ‘Other’ ideologies.